The British Broadcasting Corporation is a public service broadcaster funded by taxpayers. The BBC is unquestioningly liberal and has been for ages much like the public broadcasters in the United States. Today during their coverage of the Royal Wedding of Prince Harry to American actress Meghan Markle BBC Three posted these photo comparisons. The photo is a comparison to the early hours before the Trump Inaugural and the crowds today in England to see the Royal Wedding. This highly deceptive tweet by Binyamin Appelbaum went viral on Trump Inauguration day. The liberal media spread this lie during the Trump Inauguration but refused to report the truth that there were more people and hotel rooms booked for the Trump Inauguration than for either of the Obama Inaugurations. 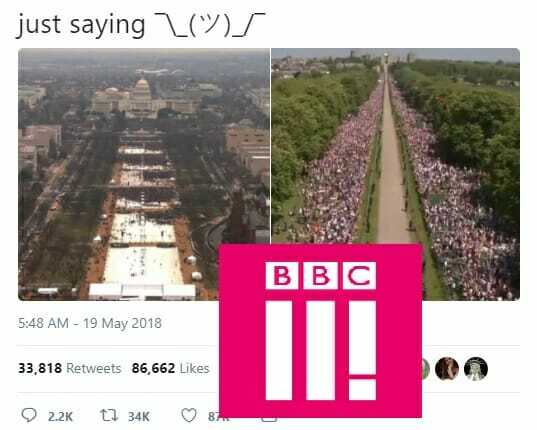 But today BBC Three decided to troll the Trump administration anyway.